T-Mobile Tuesdays got a big boost on this fine Super Bowl Sunday, thanks to a new partnership with Taco Bell. 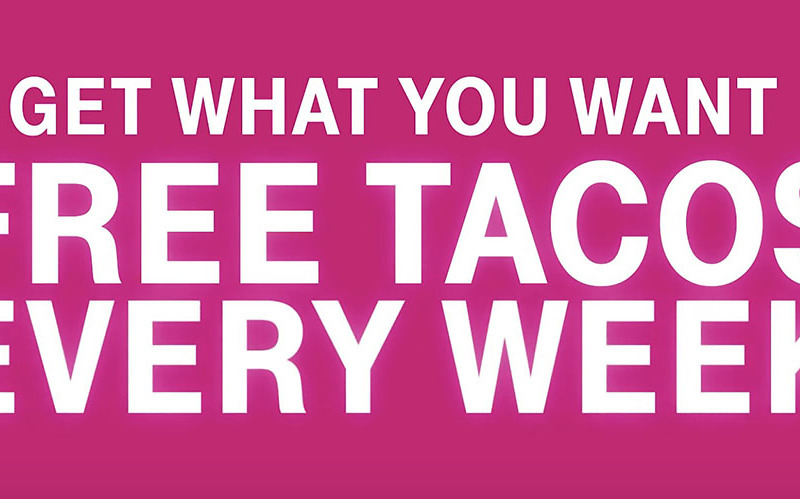 Every Tuesday, starting February 5, you’ll get a free taco (Soft Taco or Crunchy Taco) as a T-Mobile customer. How do you get free Taco Bell tacos for T-Mobile Tuesdays? You need the T-Mobile Tuesdays app (download), for one, plus you will need to redeem the offer each week within the app. You’ll also need to create an account at tacobell.com, add a credit card with your T-Mobile number associated, and then order your free taco online. Yes, you have to do these free taco orders online and then schedule a pick-up. You can order more stuff or just go with the free taco. T-Mobile says this is a straight-up free taco deal too, rather than a buy one, get one free promo. And even though you need to add a credit card to your Taco Bell account, you won’t be charged if you just order your free taco. Let’s just hope it lasts longer than the free pizza deal. Related note: In addition to free tacos, T-Mobile also announced a February promo with Lyft that can land you a free $10 ride. Details here.